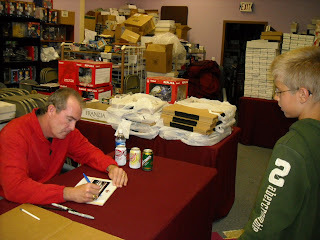 Today my sons and I traveled up to Mounds View to see Gene Larkin at Tom Frantzen's Sports Collectibles. We arrived about an hour early and there were only two other people waiting. Tom does a great job of keeping his signings organized, using a ticket system to help keep your place in line without having to stand in line the whole time. They were offering free autographs with a limit of two. 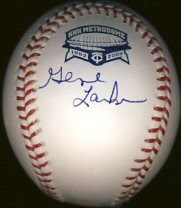 Since Mr. Larkin had the game winning hit in game seven of the 1991 World Series, I chose to have him sign a Metrodome Commemorative ball. 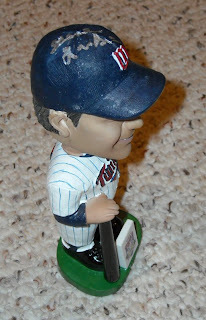 I also had him sign his bobblehead from the 1987 set. This makes bobblehead number ten signed from the 25 piece set (two players are deceased). 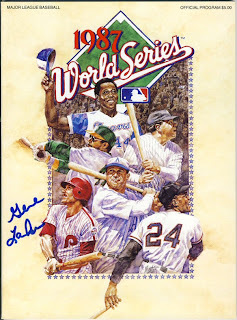 Johnny had him sign a 1987 World Series program that he bought at a card show last year, as well as a photo of the 1987 team. David got a mini bat and a 1988 Topps card signed. Mr. Larkin was very nice. David was wearing his Denard Span shirt and Mr. Larkin was asking him a few questions about him. It was a long drive, but it's a very nice store and we also picked up a couple of bat tubes and Johnny bought a Twins mini catcher's mask, should he ever get the opportunity to get Mauer's autograph again. The line for Casilla was very short and he arrived about five minutes early. After getting through the first time and having him sign my (his) game used bat, I got back in line right about where I had waited before it began. There were only about 10 people in back of me when I got up to his table the second time, so I asked if he'd just sign the three cards I had of him, which he did. I left the store at about 5 minutes after 11:00 with my four autographs and headed home. 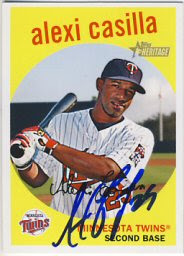 In addition to the bat, he signed 2008 and 2009 Topps Heritage cards and a 2007 Topps '52. I'm glad I was able to get items signed for my sons too, who are still on their way back from "up north". I haven't even gotten the mail yet today, so maybe I'll get some more returns. Tomorrow we'll head up to Tom Frantzen's and see Gene Larkin. Morris showed up right on time. I was fourth or fifth in line out of probably 20 people. 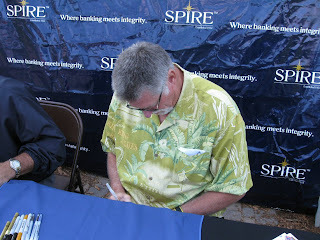 He signed my HHH Metrodome ball and then I got back in line. The employee from the credit union came over to me and told me it was okay to have him sign more than one item at a time since there were so few people in line. 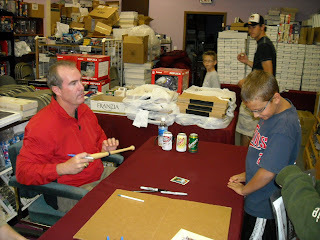 So five minutes later, I had him sign Johnny's bobblehead, an 8x10, and a 2008 Goudey. 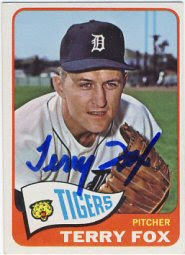 I'll let David have the Goudey or picture if he wants it. 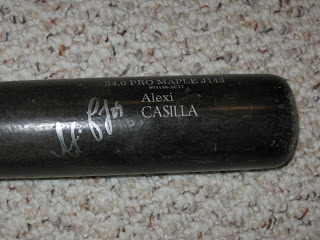 Now off to see Casilla to have him sign a game used bat. It's about 9:20 and I'm at Woodbury Days. I've been here for about 20 minutes. There's four of us here waiting around. The table is set up at the bandshell and the employees of the sponsoring credit union are getting things ready. Hopefully I'll get through the line at least twice. Holy cow, my mailbox was packed today. 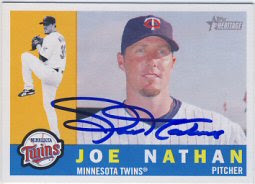 In fact, the only email I got today was autograph returns and one card I bought on eBay. No junk mail, bills, etc. Nice. 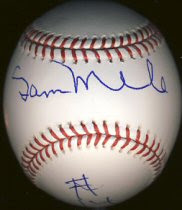 I received the ball back that I sent to Sam Mele as the start to my 1965 Twins ball. However, he wrote a very large "#14" on one of the side panels, so I can't really use this as a team ball. I guess I'll just keep it as-is. I'm not sure if I'll bother starting another one or not. I got back 11 cards from six players today. 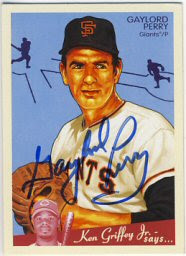 First, Gaylord Perry signed his 2008 Goudey for me. I sent $15 to a place called All Sports USA that handles his autograph requests. 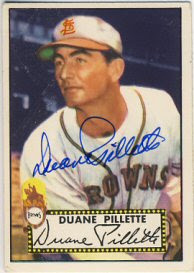 Next, Duane Pillette signed his 1952 Topps. He even put it in a semi-rigid holder for the return shipping, very nice of him. I no longer even consider using these since the White Ford incident where he signed the sleeve instead of the card. 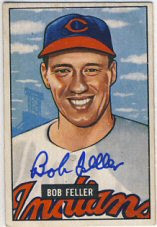 Bob Feller signed a 1951 Bowman. I've been trying to find an affordable and decent condition card for a while and finally got one. I included $10 cash with my request. 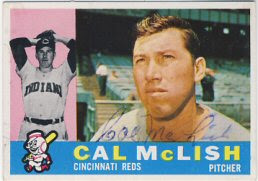 Cal McLish signed a 1959 and 1960 Topps. His pen doesn't seem to have been working great, but is still okay. 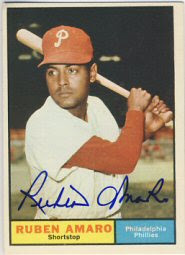 Ruben Amaro (Sr., not the Phillies Manager) signed three cards for me: a 1959, 1961 and 1968 Topps. 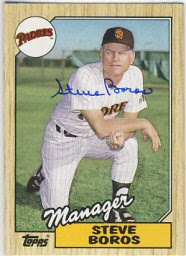 Finally, Steve Boros signed 1959, 1961 and 1987 Topps cards for me. I've spent a good deal of the evening scanning these in and putting these on my website and recording the successes on SCN. 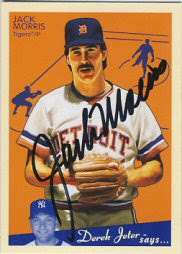 Tomorrow morning I'm heading to the Jack Morris signing in Woodbury. I'll see if I can get through the line twice before heading up to Rainbow Foods to see Casilla. 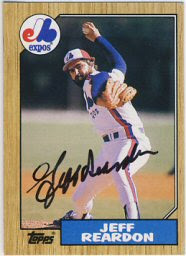 And Jeff Reardon signed his 1985 and 1987 Topps for me. This was my third attempt with Reardon over the years. He seems to have a high success rate on SCN, so I'm not sure why it took me three attempts. I'm really happy to have these though. It's shaping up to be a busy weekend. 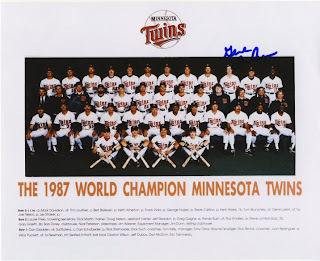 Jack Morris is signing in Woodbury Saturday morning, and then there are several Twins signing throughout the Cities, including Carlos Gomez in Blaine, Guerrier in Apple Valley, Span and Crede in Eden Prairie, and Casilla in Woodbury. I'm going to try to see Morris and then Casilla. My sons are out of town so I'll be on my own. 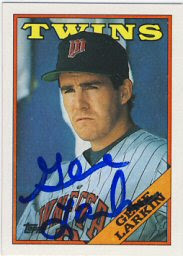 Also, on Sunday, Gene Larkin is signing at Tom Frantzen's in Mounds View. 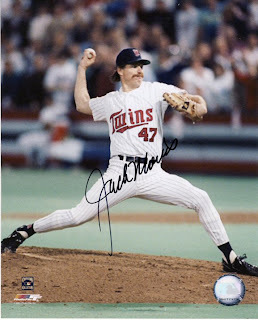 I'd like to have him sign his 1987 Twins bobblehead, and probably a Metrodome commemorative ball, since he hit in the winning run in the 1991 World Series at the Dome. The 20 or so requests I sent out last week are starting to come back. Today I got two. 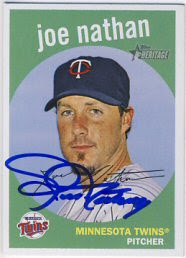 Joe Nathan signed three cards for me: 2008 and 2009 Topps Heritage and a 2009 Upper Deck Goudey. Nathan is an All-Star and maybe the best (or second best) closer in baseball. It's amazing he takes the time to sign and return his fan mail. 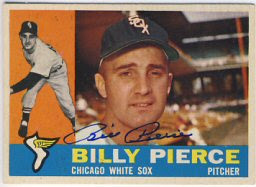 Billy Pierce signed two cards for me: a 1960 and 1962 Topps. 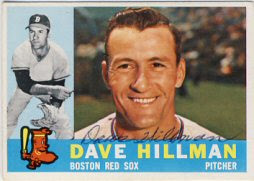 You can see that the 2009 Topps Heritage is styled after the 1960 Topps. I expect to get several more returns tomorrow. I will probably send out a few more tomorrow as well and try to keep the momentum going. I'm WAY behind my goal of 365 requests this year and doubt I'll even come close. But, I'll keep trying. I'm at the point where I'm running out of the guys from the '50's and '60's that I don't already have. 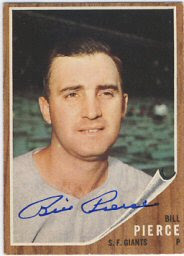 I'm sure there are some guys that only showed up in one or two cards that I don't have, but I've got most of the guys like Billy Pierce who had long careers during those decades. I bought a bunch of cards on eBay with some paypal money that my sisters gave me for my birthday. I also bought a few old magazines. 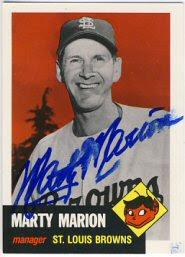 My son got a return today from Marty Marion. 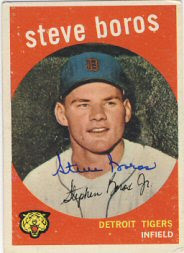 While at the card show at Har Mar Mall the weekend before last, Johnny picked up Marion's 1949 Bowman for $3. The card had a couple of light pencil check marks on it which are barely noticeable. Johnny sent the letter on August 17th and got it back today, just one week later. 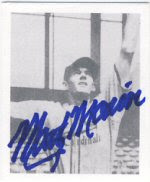 In addition to signing the 1949 Bowman, Mr. Marion signed and included a 1948 Bowman reprint, and a 1953 Topps Archives (reprint) which was a little smudged. Who are these guys? While cleaning out my mother's attic, I came across a section of the Rochester Post Bulletin from March 15th, 1938. As luck would have it, this section contained the sports section. It as Spring Training time in 1938, and there were several odd pictures of some of the players of the day. 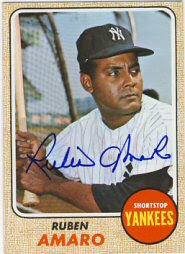 Under the heading, "What You'd See in Camp", is a picture of Burleigh Grimes, noted on baseballlibrary.com as "the last legal spitball pitcher in the majors", is show apparently "looking for an umpire." Under Grimes, is a picture of Thornton Lee and John Rigney of the White Sox singing. Not sure why they're singing. Or even what they're signing. 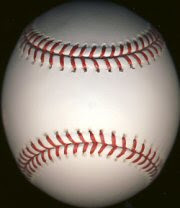 Rigney pitched the first night game at Comiskey Park in 1939. 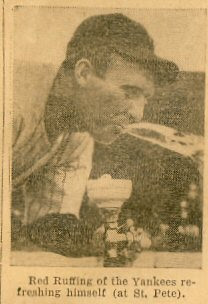 Next is a picture of Red Ruffing of the Yankees "refreshing himself". Hmmm. Finally we have a picture of Vernon "Lefty" Gomez of the Yankees wrestling with a statue, Lou Fette and Jim Turner talking, and Bill Dickey "pausing during a workout." 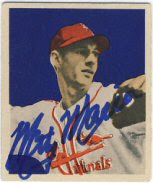 I've added links for each player to their bio page on baseballlibrary.com. You can also click on the images to see a larger version. This was a pretty interesting find. 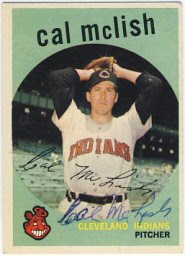 There's also an article about Bob Feller and a small section with "Notes from The Training Camps". I'm not sure what to do with this paper. It's pretty browned and brittle. Any suggestions? I spent the last couple of evenings writing a few through the mail (ttm) autograph requests. 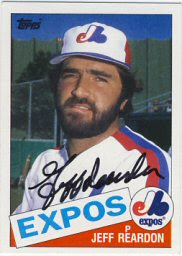 I sent out three 1952 Topps, a bunch of 1965 Topps, a few miscellaneous cards from the 50's and 60's and finally, a 1985 and 1987 Topps to the elusive Jeff Reardon (elusive to me, but apparently not to most). Fifteen requests in all. Hopefully I'll start seeing some of those come back by late next week. 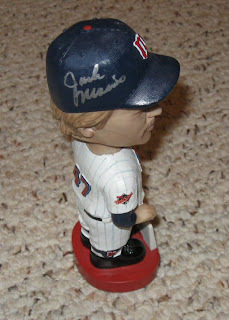 Also, I found out about a Justin Morneau signing taking place that me and the boys will be sending to. Not sure exactly what yet. 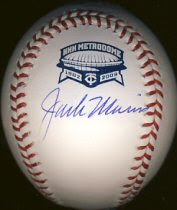 We have one 2008 All-Star Game ball left, and I'll probably send in one of the HHH Metrodome commemorative balls. Possibly a card, but not sure yet. Today my sons and I headed out to Har Mar Mall in Roseville to check out a card show there. It was smaller than usual so at first we were disappointed. However, we all found things we were interested in. My older son found a couple of inexpensive vintage cards to send out for autographs, including a 1949 Bowman Marty Marion and a 1958 Topps Bobby Thomson. He also found a nice 8x10 of Mark Buehrle that he plans to send out and a great 11x14 black and white shot of Harmon Killebrew hitting his 500th home run. 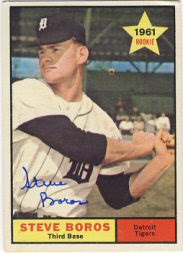 He plans on getting Killebrew to sign that at TwinsFest next year. 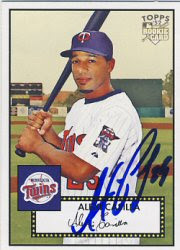 My younger son found a few items of his favorite player, Johan Santana. He got a Stadium give away Cy Young Santana figure, a few jersey cards, and an 8x10 of Santana in a Mets uniform. 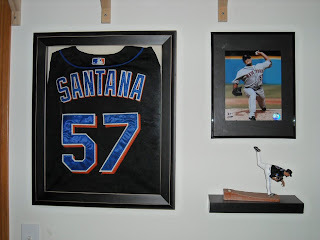 When we got home, we made a Santana display in part of his room, including a jersey that I bought from a fellow collector. Not a game used jersey, just the type you would buy in a store. 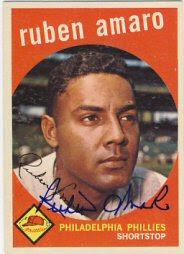 I bought about 35 cards to send out to be signed, including a good amount of 1965 Topps and several 1959 Topps. 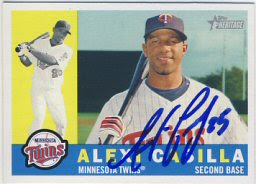 After the card show we went to the Twins Pro Shop in Roseville. We don't get over there too often so we were hoping to see some different game used items than the same old stuff we see at the Apple Valley store. They had several game used bats, but they were pretty expensive. 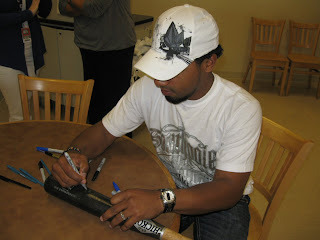 Redmond was $100, a Gomez bat that was completely broken and taped back together was $100, and they went up from there. They actually had an Ortiz bat from when the Red Sox visited earlier this year. That was $400. Ouch. We didn't get any bats. They also had some game used jerseys. At $150, they weren't too outrageous, but the selection was slim. 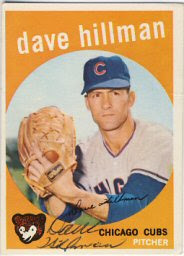 They were mostly from guys not on the team any more, like Livan Hernandez, Adam Everett (who I like) and Bobby Korecky. They also had a few of the younger guys like Duensing and Buscher. We weren't willing to spend $150 on those guys, but I did get a couple of game used caps. They were tough to sort through because they didn't have names on them, just the player's number. I don't know the players numbers by heart, so we had to go look at the jerseys and t-shirts in the store to see who was who. 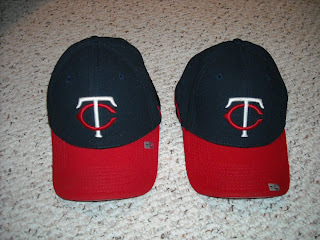 I bought a Brian Buscher cap from a game on September 7, 2008 when the Tigers visited the Twins at the Dome. The Tigers won 7-5. Buscher was 1-4 with an RBI but also committed an error. I also bought a Joe Crede cap from a game played on July 3rd of this year at the Dome, also against the Tigers. Again, the Twins lost, this time 11-9, in 16 innings. Crede went 1-8, but his one hit was a home run in the 6th inning with nobody on base. 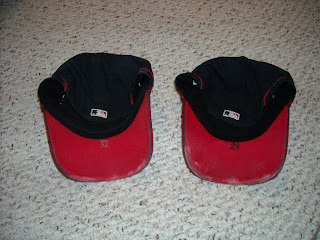 The caps were a reasonable $20, which is less than many of the new caps they sell. I might write down all the players numbers and head back to see who else is there. We know there weren't any Morneau, Span or Punto caps. They did have Cuddyer and Nathan caps for $30, which I am contemplating.